It seems silly to be growing herbs primarily in order to harvest their roots instead of berries, leaves, blossoms, or shoots. But if you’re a serious Thai cook who lives in the United States (or a chef in charge of the Thai menu at one of the world’s hardest restaurants to get into), you know why: supermarket cilantro/coriander comes emasculated. It has been decided on our behalf and without our consent that the roots — the part that we desire as much as the others — are not to be kept. Whatever the reason(s) might be, this is sad and frustrating. If you’re one of those who live in the areas where cilantro roots are available to you any time, we rejoice with you. Not only do you have at your disposal one of the essential ingredients in Thai cooking, you also enjoy the fact that your cilantro — with all the roots attached — stay fresh longer in the refrigerator. Not being so fortunate, some of us have to take matters into our own hands. Sure, the stems are a handy substitute. 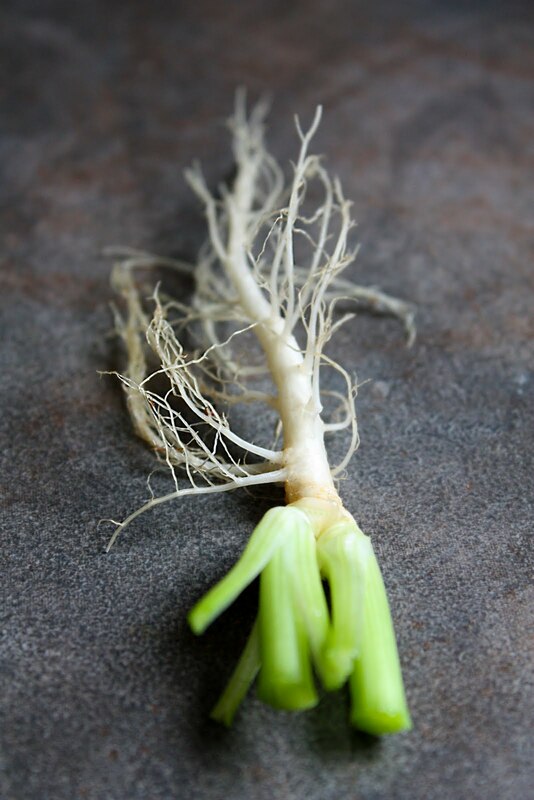 But the stems aren’t as potent as the roots, and you often need to double the amount of stems in order to replicate the flavor and aroma of the roots. In some recipes where you just want the flavor and not so much the roughage bulk (which could burn on the grill or turn an otherwise smooth sauce into a thin vegetable puree), having to use a lot of cilantro stems could be problematic. Also — not the worst thing in the world, of course — when it comes to some dishes where presentation kind of matters, the green color of the stems could mar the final appearance. The off-white roots don’t present this problem. Personally, though, it’s more about getting back a sense of control. I dedicate 5-6 weeks during the warmer months in a year growing coriander just to collect as many roots as I can to use the rest of the year. 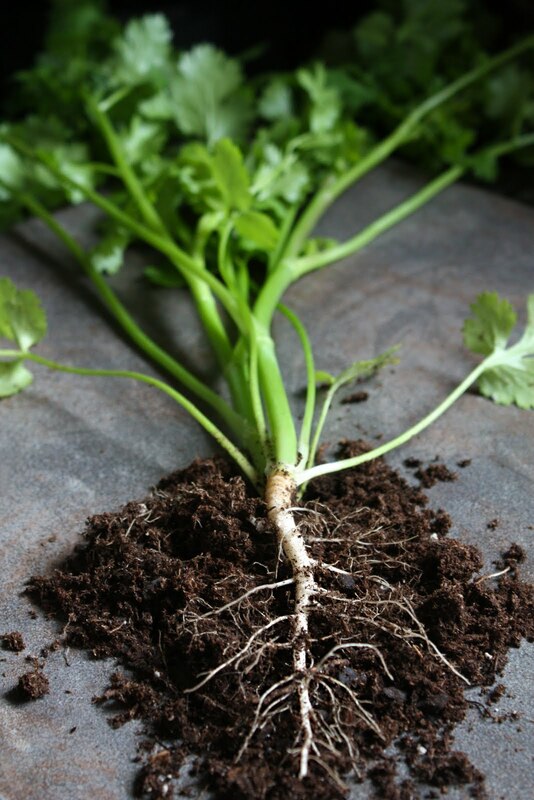 Having cilantro roots handy is the main reason, but I’m not going to hide the fact that this is also done as a way of saying, “forget you,” to rootless coriander, sitting pretty, all trimmed and everything, on the supermarket shelf. 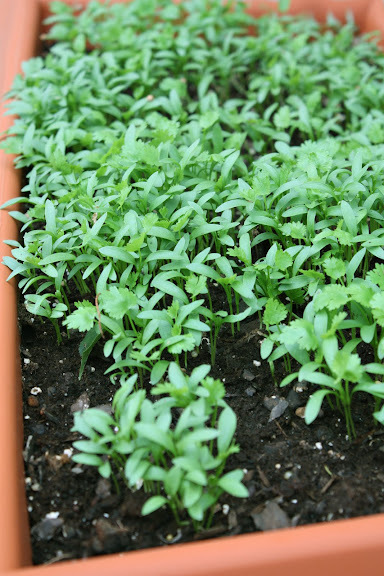 You start out with the highest quality coriander/cilantro seeds you can find. Soak them in water for 24-36 hours before planting them just to soften the outer shells of the seeds. Then fill a wide container with drainage holes, which is about a foot high, 3/4 of the way with potting soil. Scatter the seeds all over the surface of the soil. Place the container somewhere where there’s at least some sunlight. It doesn’t have to be in full sun all the time (in fact, extreme heat could cause the plants to go to seed prematurely). You can place the container on a windowsill inside the house. Within 48 hours, you’ll start to see some growth. There’s no need to do anything at this point other than keeping the soil somewhat moist (but not soaking wet). In 7-10 days, you’ll see this. As you can see, the plants are so crowded together which usually wouldn’t be an ideal situation. But since we really don’t care about what grows upwards above the ground as much as we do what grows downwards below the ground, let it be. 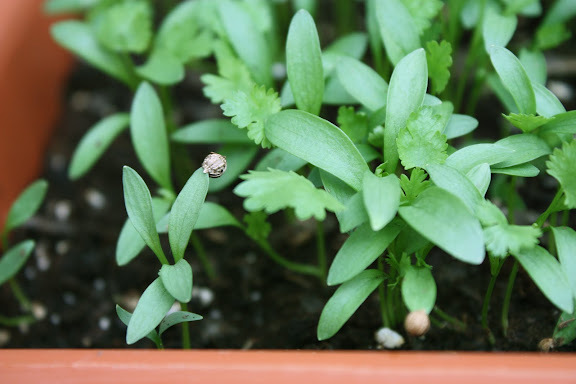 The quality of the seeds, the quality of the potting soil, the nutrients that may have been added to it, the amount of water, and the amount of sunlight all play a role in how fast and how well your cilantro grows. In general, it takes 30-40 days post-germination for the roots to be mature enough for harvest. Sometimes, it takes 50-60 days. Don’t go by the number of days; go by the size of the roots instead. But how can one measure the size of something that grows underground? After all, cilantro hates being transplanted and will drop dead on you if you pull one out of the ground and try to replant it. Well, here’s the method that I use to gauge the size of the roots. By the time the plants hit the 30-day mark, they will have developed one or two larger stems. Roots that are mature enough to use (and not too mature to the point of being woody and tough) are about 3.5 inches in length. With the roots invisible, our only clue is the size of the largest stem. Based on my observation, when the largest stem measures 15-16 millimeters in circumference (which means its diameter is about 5 millimeters), the length of the roots which are attached to it will also measure between 3-4 inches. And that falls within the desired range. If the large stems still don’t measure 15-16 millimeters in circumference, let the coriander continue to grow for another while. You can trim off the leaves and use those in your cooking, but leave the larger stems (you need them to gauge the root growth) and roots alone. When the larger stems reach the desired size, it’s time to pluck the cilantro out of the soil. Moisten the soil lightly to make it easier to pull up the roots without breaking them off. Clever! Cilantro grows like crazy in my garden, but of course it’s a goner with the first frost. Now I’ll pull up the plants and save the roots in the fall, too. It’s great that you can grow them so densely and then keep them in the freezer for later. My old housemate had coriander self-seeding in the yard, but it was not well enough watered to have nice leaves. I never looked at the roots though. what happen if I let the plant growing without using any leaves or stems? Will it become tough and no use? I see some flowers are growing from my plant. Hey Thip – Eventually the plants will bolt (go to seed). You know when that’s about to happen when they get taller, the leaves close to the bottom will become big and tough while the leaves up top get smaller (and look almost like dill). They’ll start to flower also. At that point, the leaves and stems can still be used, but most people think they’re bitter. If you start seeing some flowers, that means the plants will soon produce seeds. I’d let the flowers turns into seeds and collect them to use in cooking or to plant more cilantro. After that point, the roots should also be ready for harvest as well. If not, I’d trim off the leaves and let the roots grow further. Thank you so much, Leela. I’m going to keep the root and use the seeds to plant more cilantro. I just asked a farmer’s market seller why they don’t usually sell the cilantro with roots – apparently it’s one of those plants that will grow again if you only harvest the stems & leaves. I found this article very informative and helpful! I linked to it on my sustainable living blog. Thank you for sharing your knowledge of coriander. Thanks for this post! I had been looking all over for a way to buy coriander roots for yellow curry paste- this looks totally doable! 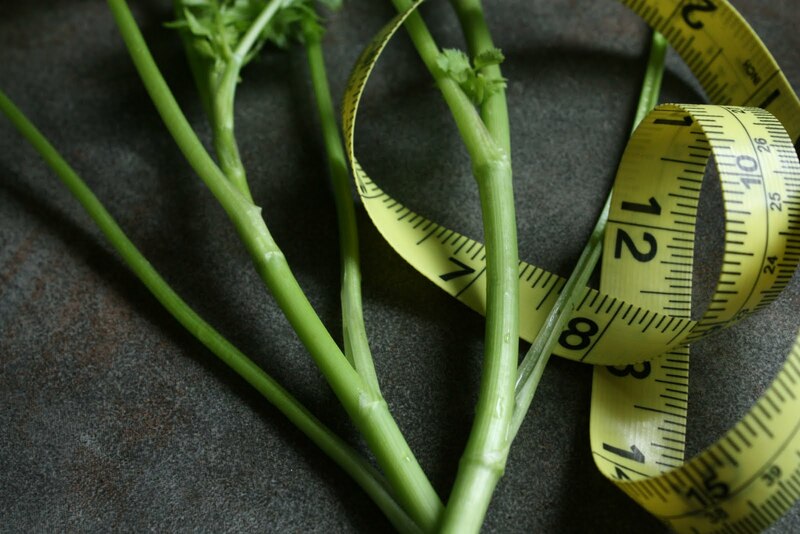 Great tip on measuring the circumference of the stems too! Where can I buy cilantro seeds for planting? I like to use roots in cooking. Thx. Anon – Any home and garden store has cilantro/coriander seeds. Home Depot, if you live in the US. Otherwise, online. I took your advice on salvaging my garden cilantro roots (Rak Pak Chee) by folllowing your advice (end of your article) on cleaning and freezing the roots. Since the Rak Pak Chee’s have grown out of control, I trimmed them leaving about three inches above the root. I now have 23 pouches (each weighing about 6 ounces) of the Rak. I use the Rak Pak Chee in the preparation of Thai soups. I also use them in preparing Kha Moo and some other stews. I cannot tell you how happy and delighted I am. Just laughing all the way to the bank. I lived in Thailand for a year and learned how interesting it is to use the roots rather than the leaves, and was most dismayed when I cam back to Europe to find that I could not find coriander with roots. Thank you so much for sharing this: roll on spring, I can’t wait to try and grow my own roots! khop khun maak kha for your suggestion on growing cilantro for roots. I am starting growing them for roots in the pot so I can move in the shade when it’s so hot. Just can’t wait. Thank you. I will take this to a Thai supermarket up Mission, see what they’ve got, ask what they can get. I’m starting to get into windowsill growing/sprouting on scallions, this is the next step. I’ve actually had some luck transplanting cilantro, you just have to be very gentle and do it quickly in a warm environment. I just repotted a young plant that was doing poorly (it didn’t get enough light early on and grew too leggy). I buried a couple inches of the stem and about a week later it’s growing stronger than ever.